Learn the Tibialis posterior transfer (through interosseous membrane )for foot drop surgical technique with step by step instructions on OrthOracle. Our e-learning platform contains high resolution images and a certified CME of the Tibialis posterior transfer (through interosseous membrane )for foot drop surgical procedure. 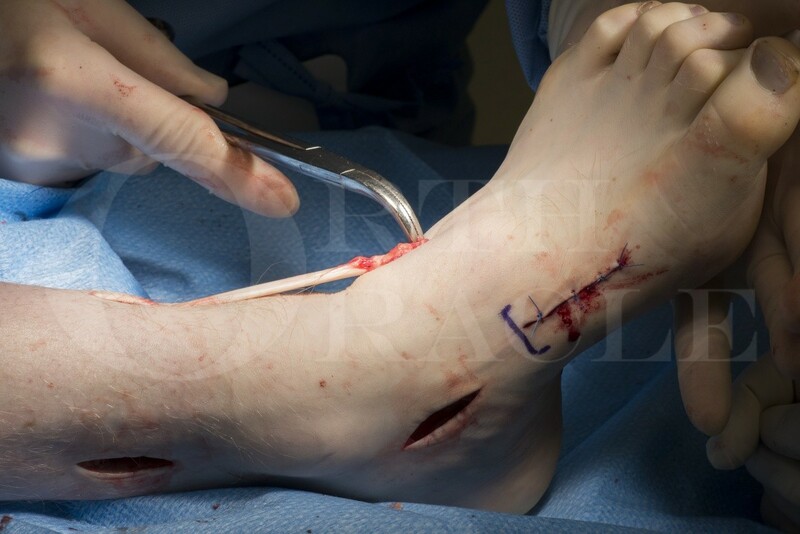 Tibialis tendon transfer is performed for drop foot, when the foot and ankle dorsiflexor muscles are not working. This may be due to disc disease (or surgery) when the L5 nerve root is damaged, after trauma or compartment syndrome when the muscles are damaged, or as part of neurological disease. Historically the commonest cause for loss of dorsiflexion from nerve disease was polio. Although the disease is probably eradicated now, there are still many patients with old polio and drop foot in the underdeveloped world, but in the UK commoner causes are CMT and mononeuritis . Loss of dorsiflexing power can usually be ameliorated by drop foot devices, but for a variety of reasons, including cosmesis, this may not always be accepted. To perform successful tendon transfer, it is necessary to have a motor unit that works, and examination and testing of the tibilalis posterior tendon is important prior to transfer . Meticulous surgery, prolonged splinting and prolonged rehabilitation are also necessary to obtain well-functioning results. Institution : The Nuffield Orthopaedic Centre , Oxford ,UK.